I've been to Pongsri before and they do pretty good Thai for midtown. 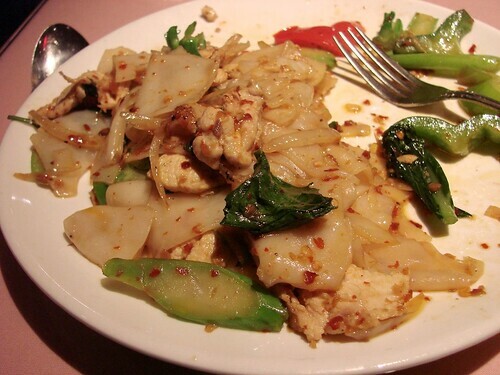 This time I was in the mood for something with a kick so I ordered the chicken Pad Ki Mao and asked for it spicy. The waitress didn't bat an eye. There was no spiciness negotiation. No, "are you sure you want it spicy?" And when the food arrived it had enough heat to make my nose run just a little. Now that's a succesful lunch in my book. I later noticed if you look at the bottom of the menu at Pongsri it says: "All Dishes Indicating * Can Be Made To Order From Less Hot & Spicy, Hot & Spicy, Very Hot & Spicy, Thai Hot & Spicy." Next time I'm kicking it up to Very Hot & Spicy. better than pam real thai a block west? @anon: I've actually never been to Pam Real Thai. Are you a fan? What do you recommend there? Oh man, I love Ponsgri Thai! I like a meal that makes my nose run juuuust a little. Not sure if I'm ready for "Thai Hot & Spicy," though! Ham & Cheese is Back at Pret! Bringing Pop Pies to the People!! Holiday Pop Pies and Baking off at Bon Appétit! Lunching at Shopsins: Oh, Calcutta!